Gellért Hill and the Citadella, Budapest | Travel? Yes Please! Gellért Hill is the place to go for the best panoramic views of Budapest. From the top, you get unrivaled views the Danube river and both sides of the city- Buda and Pest. Yet, Gellért Hill is much more than a dramatic viewpoint. As one of the earliest inhabited parts of Budapest, the hill has played a significant role in Budapest’s history. Gellért Hill is a 235 metre high dolomite rock, looming over the Danube on the Buda side of Budapest. The hill was named after St. Gellért, Hungary’s first missionary, who was killed there by pagans during a rebellion. Gellért Hill has been inhabited since prehistoric times. The cave-dwellers that once lived here made use of the hot springs below, the same springs that still supply the Gellért spa today. In Roman times Celts lived in this area, which was only about 2 kilometres from the Roman city of Aquincum. In the 18th century the hill was covered in vineyards, making it an important centre of wine-making in Buda. By the mid-1800’s, Gellért Hill was recognized as a strategic location and a fort was built here by the ruling Austrians to exercise control over Budapest. The hill went on to be used in other military operations during World War II and the 1956 Hungarian Revolution. The hill’s important role in Budapest’s history led to it being listed by UNESCO as a World Heritage Site (as part of the Banks of the Danube) in 1987. Gellért Hill shares this designation with Buda Castle and Andrássy Avenue. Nowadays, Gellért Hill is an affluent residential area, with treed parkland and historical monuments. It is a great place to simply sit and enjoy the sweeping views of the great city of Budapest. While buses do connect Gellért Hill to the rest of the city, the best way to experience this area is to walk. 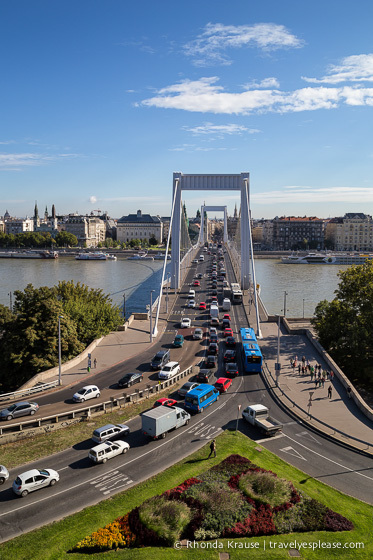 There are two places you can start your climb up the hill- at the Gellért Hotel or the end of Elisabeth Bridge. We decided to start at the end of Elisabeth Bridge, since it was close to our hotel. From here, we climbed up the staircase leading to the Gellért Monument. After a brief stop to look at the statue of St. Gellért, we continued on our way, following the winding path through a forested area until we reached a clearing at the top. We were immediately greeted by a wonderful view of the city and Buda Castle. It was hard to tear ourselves away from this beautiful viewpoint, but we continued on a little ways up the road to the main attractions of Gellért Hill. Gellért Hill has a few things to enjoy, besides the amazing views. The main tourist attractions are the Citadella, Liberty Monument, Cave Church, and Gellért Monument. The Citadella is a sprawling fortress, turned tourist attraction, which sits atop of Gellért Hill. It’s about 200 metres long, with walls that are roughly 6 metres high and 3 meters thick. Built by Habsburgs in 1854, it was a symbol of threat to the Hungarians now under Austrian control, after the failed Hungarian War of Independence (1848/49). The fortress was strategic in its location, with a clear overview of both Buda and Pest. The Austrians equipped the Citadel with 60 canons, but they were more there for demonstrating control rather than engaging in actual battles. An army tank on display at the Citadella. The Citadella remained under control of the Habsburgs until they left Budapest after the Austro-Hungarian Compromise of 1867. With the Austrians gone, ownership of the Citadel reverted to the city. As an act of victory, parts of the walls were torn down. Instead of completely destroying the Citadel, as was initially wanted, the Hungarians used it for other purposes. Over the years it served as a prison camp, site of an anti-aircraft battery and temporary accommodation for the homeless. The Citadel also played a role in World War II when it was used by a German SS regiment to keep the city at bay. The Citadella has been used as a tourist attraction since the 1960’s and its old barracks were converted into a hotel. The Liberty Monument can be seen from almost all parts of Budapest, a reminder of Hungary’s liberation from Nazi rule at the end of World War II. Erected in 1947 at the Citadella, the monument consists of three statues, the central one perched high on a pedestal. The Liberty Statue is a female figure holding a palm leaf, symbol of victory and success, above her head. Below her, on either side, are two statues representing progress and evil. One male figure holds a torch, representing progress, while the other figure wrestles a dragon, representing the defeat of fascism. Near the bottom of Gellért Hill, across from Gellért Hotel, is the Cave Church. The church was founded in 1926 and makes use of the natural cave system in Gellért Hill. The church was used by the Pauline order until 1951, when the Communists shut it down and boarded up the entrance. The church did not reopen until 1989. We didn’t actually go into the church, but I did stop to take a picture of the statue of St. Stephen, first Christian king of Hungary, near its entrance. Behind the statue is a nice view of the Liberty Bridge. The steeper route up the hill starts at Gellért Hotel. We climbed up from Elisabeth Bridge and it wasn’t too bad of a walk, maybe taking us about 15 minutes. If you prefer not to walk, you can also take a bus to the top. It doesn’t cost anything to wander around the exterior of the Citadella, but there is a fee to go inside and see the museum.